Computer Assisted Rehabilitation Environment (CAREN) is used to treat patients with a variety of neurological and orthopedic problems, such as back pain, poor balance and posture, gait (walking) disorders, etc. 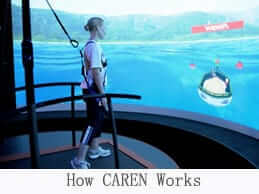 CAREN is also highly effective for sports trauma and pediatric rehabilitation. 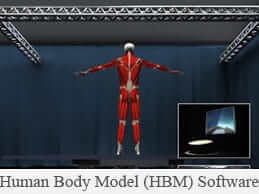 Virtual Environment techniques are used to manipulate environment interaction conditions therefore facilitating the learning process in both virtual and real environments. Immersive environment enables the development of new movement strategies and unlearning the poor movement habits that arise due to pathology or compensatory processes. Directing the patient’s attention to the effects of the movement (external focus), in contrast to the attention to the movement itself (internal focus), contributes to rapid recovery. Motor imagery provides access to cortical pathways responsible for stored memory of movement patterns in place prior to the injury. Motor imagery also presents a very effective way to engage deep spinal musculature that is responsible for fine control of the dynamic posture and general stability of the spinal column. All gait and other movement parameters are on display in real time for monitoring and intervention. 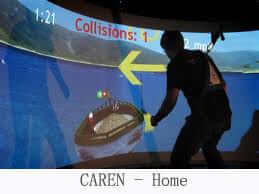 This feature that has been available only in research labs is now offered in CAREN. For example, waves’ direction, amplitude, frequency and gain can be operator-controlled enabling targeted response by the specific muscle groups. Evaluation and training of gait and dual tasking in the virtual environment. For example, when running the Road application every bump and slope, simulated by the Motion Platform, is physically felt by the patient. Below are 2 videos that demonstrate how CAREN can be used to treat various orthopedic conditions, e.g. amputation, arthritis, whiplash, osteoporosis, joint replacement, diabetic foot conditions, lumbar and cervical disc disease, foot/ankle/knee injuries.